The Verizon-exclusive Moto Z3 is billed as the world's first "5G-upgradeable" smartphone, but obviously, that's not the only thing the versatile device can do when paired with a magnetic Moto Mod. The company's full lineup of feature-expanding accessories (minus the 5G Moto Mod) supports the entire Moto Z handset family, most likely including the upcoming Z4 and/or Z4 Play. If you're interested in seamlessly improving the capabilities of your Z-series phone, Best Buy is today (and today only) offering a massive 50 percent discount on a number of Moto Mods. Specifically, five different variants, starting with the JBL SoundBoost 2 portable speaker and GamePad case, both of which are typically available at $79.99 a pop. These half-off deals essentially allow you to pick both of those bad boys up at a combined price of 80 bucks, although naturally, you can't use them simultaneously. That's perfectly okay considering they serve two very distinct purposes. Namely, the GamePad aims to enhance your mobile gaming experience with dual control sticks, a D-pad, and four action buttons, as well as an additional 1,035 mAh built-in battery for up to 8 hours of endurance. Meanwhile, the SoundBoost 2 will... boost your sound, obviously, also including a kickstand and up to 10 hours of battery life. Moving up on the Moto Mods food chain, we find the Amazon Alexa-powered smart speaker add-on priced at $74.99 after its very own 50 percent markdown, as well as a $100 True Zoom Camera and Insta-Share Projector. The smart speaker mod probably needs no explanation, essentially turning your phone into an Echo clone while also maintaining the handset's basic set of features. 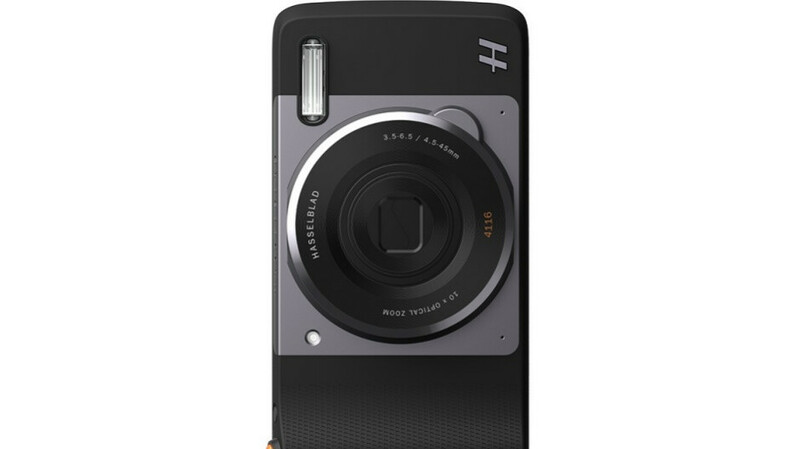 As for the Hasselblad True Zoom Camera and Insta-Share Projector, it's worth pointing out that Motorola actually lists those two on its website at a price of $299.99, which means you're looking at even heftier savings than 50 percent at Best Buy. The former Moto Mod comes with 10x optical zoom functionality and a Xenon flash for improved low-light photography, while the latter can project movies, photos, and shows on a surface of up to 70 inches. American bestbuy only gosh darn it. A company do a legitimate, relevant advertisement for it's product? No way. Only Apple & Samsung can do those. Loving my old Moto Z Play. Best battery life I've had with a phone.